If you are using any integration below, we suggest using our specific set up guides for each integration. Your first step to integrating live chat into your site is to sign up for a Social Intents account and create a Live Chat App. 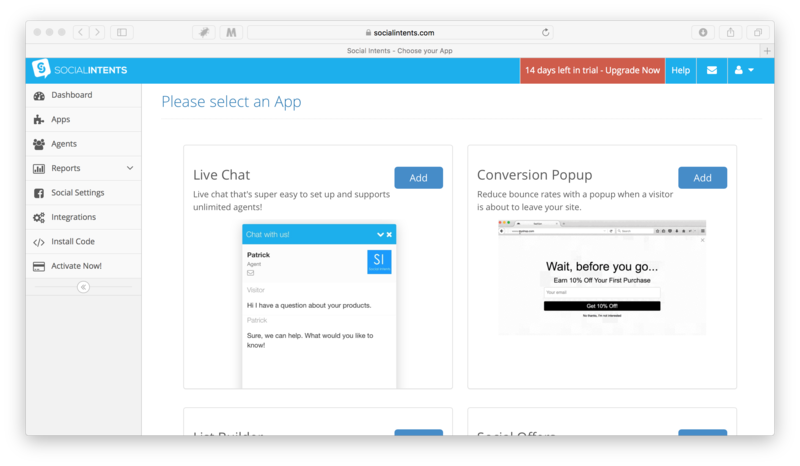 After logging in the first time, click on the Live Chat add button to create your first app. Next, you’ll see the default Live Chat settings page. You can customize text and options then click Save at the bottom of the page. After saving the settings the first time, we’ll generate a code snippet that you can include in your web page. You’ll see this on the “Your Code Snippet” tab under your widget settings. To include the code into any html page or template, simply copy and paste the code right before the closing </body> tag of your page or template. For certain platforms you may not be able to do this, anywhere inside the body of the html page should work fine. If you are using the Wordpress plugin, you have likely signed up right from the plugin. You can update your settings right from the plugin. For advanced settings, you can make changes on our website. Your settings will stay in sync between the plugin and our servers after you make updates to either one. If you’re using a plugin, you do not need to include any code snippet into your template. Simply copy the Widget Key into the plugin settings. You can find your Live Chat Key under the “Your Code Snippet” tab. Simply copy this key into your plugin settings to activate the plugin on your site. If you want to chat from your mobile phone and need immediately inbound notifications, we suggest downloading the Pushover.net mobile app or using our Slack Integration. When changing either of these items, you have to re-include the generated code into your web page. You can use either our Slack integration or Pushover.net for your mobile client apps.